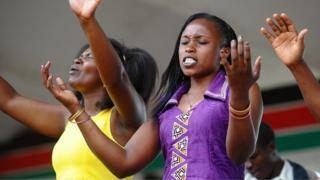 Kenya's evangelical churches have condemned government plans to make it tougher for religious bodies and clerics from all faiths to operate. But a leading Anglican cleric welcomed the proposals as an attempt to end the "commercialisation" of religion. Their main body, the Supreme Council of Kenya Muslims, was also opposed to the proposals, warning they could violate "freedom of worship and amount to a clampdown on religious institutions", the privately owned The Standard newspaper reports. The Catholic Church - the largest Christian denomination in Kenya, and to which President Uhuru Kenyatta belongs - has not yet commented on the proposals. The BBC's Muliro Telewa in the capital, Nairobi, says Attorney-General Githu Muigai unveiled the proposals last week, and would hold public consultations before drafting legislation. "Registration of churches was stopped since 2014. We believe this is meant to stop evangelism and growth of the church since other societies are being registered freely," said EAK chairman Bishop Mark Kariuki, the private Daily Nation newspaper reports. He said: "2017 is very close and we will not hesitate to use those [voter] cards." "Horrible things are happening in the church today. There is a lot of commercialisation of the gospel with this prosperity gospel," he is quoted by The Standard as saying. "Perhaps God is using the state to punish the church as he did in the past, where he used kings or nations to discipline the church," he added. Last week, Kenya's Communications Authority published new broadcasting regulations which will ban preachers from soliciting money on air.